Our Favorite Public Bike Paths Across The Country! The bicycle wasn't so much invented as it evolved. It's hard to pin down the exact day rubber met the rode on two wheels, but in 1818 a patent was in place for a "two-wheeled, steerable, human-propelled machine" known at the time as a velocipede. It took a number of years to refine the design, such that it would be useful and comfortable, but the 1890s saw a surge in cyclists, including women. Soon day trippers and travelers would experience the benefit of riding on two wheels covering more of the countryside in less time. California is among the most bicycle-friendly states with San Francisco being one of the most bicycle-friendly cities. In San Fran they head to Polk Street, the north-south thoroughfare that sees car and bike traffic with the two sometimes coming dangerously close together, but further inland the more relaxing course is the American River Bike Trail, which is a 32-mile multi-use path that people use everyday for recreation and transportation. The trail runs between downtown Sacramento, CA and Folsom, CA, which has its own network of trails to enjoy. Colorado is an outdoor sports mecca with more than 300 miles of bike trails in Boulder alone! The state is chock full of bike paths like the Greenway Trail that runs along the South Platte River. It's a paved trail that follows the river for nearly 30 miles, past parks and visual markers that illustrate the history and call out the highlights of the area. Stop along the way for lunch, visit the Hudson Gardens to see what's in bloom or pick up another trail from the Hatfield State Recreation Area where the Greenway ends. 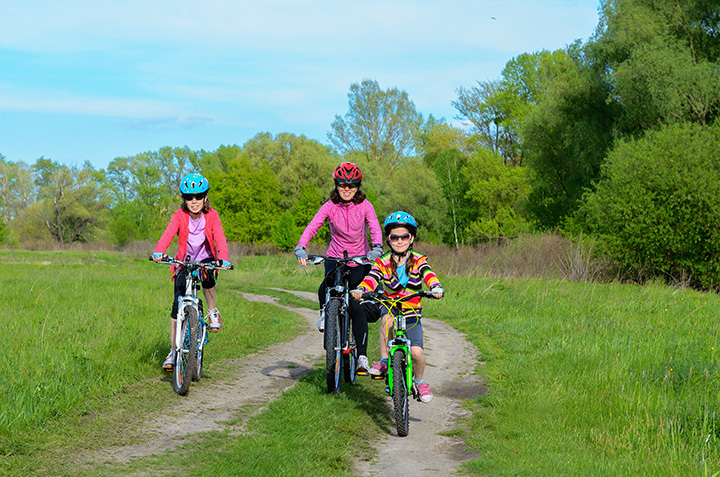 Delaware is a small state with big plans for promoting biking, hiking and walking for the health and enjoyment of their citizens and visitors. The state currently has more than 500 miles of public trails and multi-use pathways and they are committed to maintaining and improving that network. Most of the trails are short, but scenic, like the Gordons Pond Trail in Cape Henlopen State Park through a coastal maritime forest past grassy marshes and a salt water lagoon. Another favorite is the Pennypack Trail, that was extended in 2015 and now runs for 14 miles along Pennypack Creek, "including a 143-foot bridge over the scenic waterway." The Friends of the Coeur d'Alenes work hard to keep the 72 miles of bike path clear and welcoming for the residents and visitors who enjoy the beauty of the "paved path that takes you from high mountain splendor, through the historic Silver Valley into the chain lakes region, along the shore of Lake Coeur d'Alene." Check their website for the status of construction that may require some course changes. Cyclists return for the scenic western landscape that includes "rolling farmlands" and "17 scenic waysides for picnicking." Massachusetts is on the top ten list of bike friendly states and Cape Cod, a place familiar to Massachusetts and New Englanders as a vacation paradise has a number of places to rent a bike for a seaside or inland ride. The Cape Cod Rail Trail that starts in Dennis, MA is a hot spot for two wheelers who enjoy the mostly flat terrain that is "well-marked" with plenty of "opportunities to get off the trail and visit a beach" or grab a lobster roll for a quick lunch. Back in 1882 landscape architect Horace Cleveland had a vision for the future of Minneapolis that included parks and green spaces with boulevards, parkways and paths to link it all for public enjoyment. It's called the Grand Rounds and National Scenic Byway. It's a biking/driving/hiking route open to all that loops around the city of Minneapolis past lakes and rivers. The 17-mile southern route passes the Chain of Lakes, Minnehaha Creek and the Mississippi River. The northern loop goes through Theodore Wirth Park and along the historic riverfront. When cyclists get together to talk about bucket list bike trips, the Katy Trail comes up. It is the longest rails-to-trails path open to the public for biking, hiking and horse back riding. The 240-mile-trail cuts across most of Missouri with some sections that are part of the Lewis and Clark National Historic Trail and the American Discovery Trail. The Blue Ridge Parkway runs for 469 miles through Virginia and North Carolina with elevations ranging from 600 to 6,000 feet. Start your ride in historic, hip Asheville and peddle your way past majestic mountain scenery. Stop along the way to watch a waterfall or the sun set. Trail highlights include James River & Otter Creek, Moses H. Cone Park and Mount Pisagh. Make your trip in the fall for breathtaking foliage displays. Oregon has much to offer the weekend warrior. It's a state with some of the best hiking, biking and skateboarding and Crater Lake in Southern Oregon is one of the most popular places for cyclists. The rim route is 32 miles and considered challenging, but if that's not tough enough for you, sign up for the Crater Lake Century ride, which is an annual ride and benefit. Choose from 62 and 100-mile routes that begin and end at the Fort Klamath-Lake Museum. Crater Lake is the deepest lake in the U.S. and is described as a place of immense beauty where "even seasoned travelers gasp at the 20-mile circle of cliffs, tinted in subtle shades and fringed with hemlock, fir and pine." The Great Allegheny Passage is call the Gap Trail. It weaves its way from Washington, D.C. to Pittsburgh, PA, joining up with the C&O Canal Towpath in West Virginia and the Montour Trail in Pennsylvania. The full length of the trail is 150 miles, but cyclists revisit their favorite routes, venturing further when time and adventure allows. A good deal of the trail "is built on the abandoned grades of the Western Maryland Railway and the Pittsburgh and Lake Erie Railroad."